When David Ben Gurion moved to Thessaloníki to learn Turkish in 1910, he was surprised to discover a city like none found in “Eretz Israel”: The Shabbat marked the day of rest here, and even the dockworkers were Jewish. He was advised not to admit he was Ashkenazic (all the procurers were). Jewish and Sephardic, Thessaloníki had been called “Mother of Israel” for over three centuries. 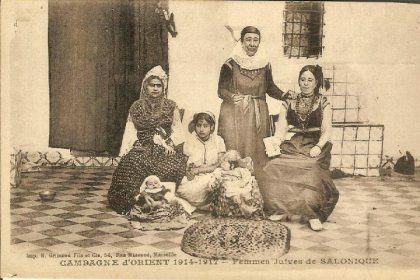 A haven for Jews expelled from Spain, it resembled both a lost canton of Judaea and a neighborhood in Castile or Navarre. The language of the street was Judeo-Spanish (Judezmo and Ladino) while the elites here spoke French. Not far from here, nestled at the far end of the Thermaic Gulf (Gulf of Salonika), Hellenized Jews had already converged beginning in antiquity. Saint Paul, after preaching three consecutive Shabbatim in local synagogues, had to flee under cover of night. The Romaniotes, as Jews of the Eastern Roman Empire were commonly called, suffered countless invasions here. Sold to the Venetians, the city was conquered before Constantinople by Ottoman armies in 1430. Sephardic refugees were welcomed with tolerance in Thessaloníki by the thousands, and then by the tens of thousands. The sixteenth century was the golden age of the city’s Diaspora. Samuel Moise of Medina, the century’s most preeminent rabbi and author of a thousand responsa, summed up in a sentence the intellectual splendor of the era: “We abound in the learned and librairies; knowledge is widespread among us”. Such blossoming was commercial as well, thanks to the Thessaloníki’s position as a stopping point between Venice and the Ottoman Empire. In 1556, a boycott of the port of Ancona was launched by Levantine Jews at the instigation of those in Thessaloníki, in protest against an auto-da-fé of twenty-five Portuguese Marranos on the order of Pope Paul IV. Moreover, the woolen garments worn by the powerful and fearful Janissaries were woven in the Jewish workshops of Thessaloníki. In the late nineteenth century and encouraged by the Universal Jewish Alliance in Paris, philanthropic organizations, clubs of freethinkers, and political committees began to appear here. The entrance of Greek troops in 1912 was greeted with apprehension by the Jews, due to the fierce economic rivalry between the two populations. Rightly or wrongly, the Jews suspected that the great fire of 1917, which ravaged the Jewish quarter and devastated its thirty-two ancestral synagogues, had been an intentional act. Thus began the emigration of tens of thousands of Jews to France and the United States in particular. Two events sped this exodus: the transfer of Greco-Turkish populations here as decreed by the 1923 Treaty of Lausanne, which shifted the demographic balance between Greeks and Jews, a pogrom in the Jewish quarter of Campbell in 1931. The years later, in April 1941, the first German columns marched into Thessaloníki. By the summer of 1942, all Jewish men were ordered to appear at the large Elefterias Square: for hours, they were subjected to humiliation by the Nazis before crowds of onlookers. The expropriation of the great Jewish necropolis was implemented -much to the satisfaction of the Greek authorities, according to Joseph Nehama. From March to August 1943, 46000 Jews from Thessaloníki, or 96% of the Jewish community here, were deported and exterminated in Auschwitz-Birkenau. Fewer than 1500 deportees survived. Jewish Thessaloníki had seen its final days. More than half a century later, in 1999, a monument commemorating the Shoah was put up here. At first glance, nothing recalls the “Jerusalem of the Balkans” in modern Thessaloníki, with its cold, crumbling concrete architecture. So thoroughly have their traces been erased, one might wonder if Jews had ever been present here, when they had in fact been the majority here until the 1920s. To start your visit, you can first go to the Jewish community center of Thessaloníki. Several beautiful villas once belonging to the most prominent Jewish families were miraculously spared during the frenzied real estate speculation that struck Thessaloníki during the 1950s. They were built in middle-class Belle Époque style on a boulevard once named Hamadié, now called Vassilissis Olgas (Queen Olga). Two Italian architects fought for the favors of the rich merchants who chose to settle here. At 182 Vassilissis Olgas Boulvard sits the eclectic “Casa Bianca”, built for the Fernandez family and designed by the architect Piero Arrigoni. More classic and luxurious, the villa once owned by Charles Allatini, Thessaloníki most important Jewish miller, was built based on plans by Viteliano Poselli, at number 198 of the same boulevard. From 1909 to 1912, Ottoman sultan Abdul Hamid II was forced to reside here after the Young Turk Revolution. 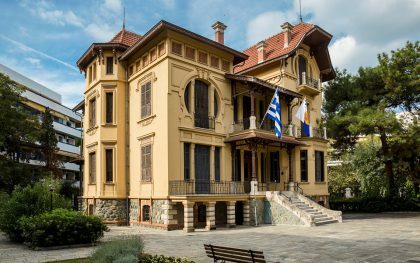 Housing the Macedonian Folklore Museum, the former Modiano family mansion is located at 65 Megas Alexandros Avenue. Across the street from the Archaeological Museum of Stratou Avenue, a mosque was constructed in 1902 for the deunmé community, Jewish converts to Islam following the heresy of Sabbataï Zevi. 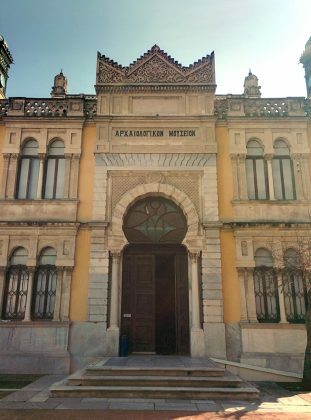 The work of Poselli, the new mosque, Yeni Djami, combines turn-of-the-century Ottoman architecture with Renaissance, Baroque, and Moorish elements. Monastirioton is the most important still active in Thessaloníki. Built in the 1920s by Jews originating from Monastir, a city located in current Macedonia, it was used by the Red Cross during the Second World War. The structure was copied exactly from classical Sephardic design, the aron kodesh to the east, and the chest of the bimah to the west. Another synagogue, Yad Lezikaron was reconstructed in 1984 inside a modern building on the Herakleios Street. The arch comes from the former Kal Sarfati, the French synagogue, while the bimah originates from the Baron Hirsch Synagogue, which bears the name of the famous Jewish philanthropist. The museum of History of the Jews of Thessaloníki is located in what was once a Jewish bank. Its permanent exhibition explores the life and culture of the Sephardic community of the city since the fifteenth century. The Yad Lezikaron Synagogue and the the museum of History of the Jews of Thessaloníki are located i the district around the Modiano market, named after the large Jewish family that originated in Livorno. All sorts of trades were practiced by Jews here, as much in the metal and glass-roofed market as in the surrounding neighborhood. Thessaloníki’s oldest ad largest bookstore, Molho Solomon, is located in a stret parallel to Herakleion Street. A meeting place for the cultural elite, this bookstore belonged to the Molho family, who were saved during the war by a Greek Orthodox family. In the exact spot of the ancient Jewish necropolis now stands Aristotelous University. The huge cemetery, where the remains of twenty generations once lay, was destroyed by the Nazis to the great satisfaction of the local Greek authorities; crowds of pillagers then descended on the site, convinced that the Jews, already packed in ghettos, had hidden their treasures there. The tombstones were later used in the construction of school playgrounds, university stairwells, sidewalk gutters, and even barrack latrines; at times, the funerary inscriptions were not even removed and still can be read today. The modern cemetery, where a few ancient gravestones have been gathered, is located on Karaoli Demetriou Street, across the street from the AGNO factory.